We realize that campus parking at UF Health is challenging and can be frustrating. Balancing the needs of patients, faculty, staff, trainees and students who all have real needs for the same limited resource necessarily involves compromise. And patient and visitor parking that is close and accessible to our services remains a top priority, making parking for faculty and staff close to our workplaces even more challenging. The opening of the new heart and neuro hospital and the need to make sure that we meet the needs of patients and families receiving services at the new facilities resulted in the need for changes to parking prioritization and assignments in three locations: the South (Cancer Hospital) Garage, the Heart & Neuro Hospital Garage, and the 1329 Building Garage. Decals for parking garages closer to these core facilities will cost more than decals for garages that are farther away. Decals for gated parking with guaranteed available parking spots closest to these buildings will cost the most. Since priority for parking closest to the heart and neuro hospitals will be granted to those who do their work in the new hospitals, all faculty and day shift staff who do substantially all of their work at the cancer hospital and/or the heart and neuro hospitals must set their parking location preferences at https://bridge.ufhealth.org/shands-facilities/services/parking-services/employee-parking/parking-decal-assignment/ by July 1, 2018. Staff who work in the 1329 Building may apply to be considered for a new decal in one of these garages. Email notification of parking assignments will be sent prior to Aug. 1, 2018. Faculty or staff who do not indicate a preference will not receive preference for assignment. 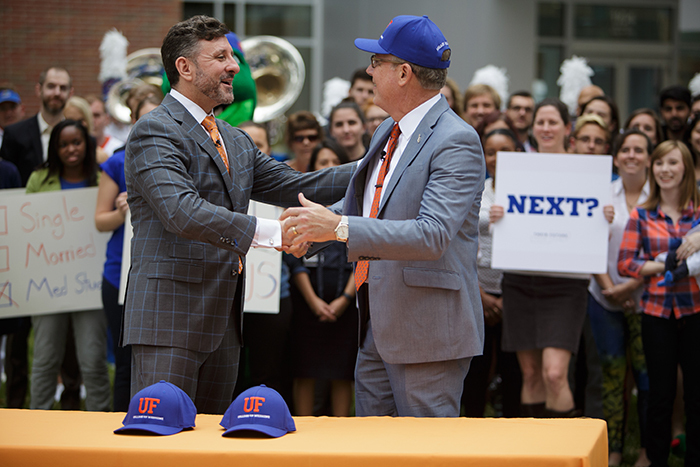 The usual $25 fee for changing assignments during the year has been waived by UF TAPS. New price: Because of its close proximity to the hospital, the Yellow Decal price for this garage will increase to $606.00 per year. Availability: Space availability is not guaranteed. Overflow parking for the South Employee Garage is in any Blue, Green, or Any decal area. Eligibility: The garage is available for faculty and staff working at the cancer hospital, 1329 building, and/or the heart and neuro hospitals. Staff meeting these criteria are eligible to request a decal for this garage. Staff who already hold a decal for this garage must restate their preference and will be grandfathered in if they choose to pay the increased fee. New price: Because it is the closet in proximity to the new heart and neuro hospitals, this garage will become gated and parking access will be reassigned. The decal price will correspondingly increase to $1,212 per year. Availability: Space availability guaranteed with decal. Eligibility: The garage is available for faculty and staff working at the cancer hospital, 1329 Building, and/or the heart and neuro hospitals. Staff who meet these criteria are eligible to request a decal for this garage. The garage will become gated only; there will be no impact to current gated decal holders at this time. The gated decal price will be $1,212 per year. There will be no Blue decal spaces in this garage. Eligibility: Staff who already hold a gated decal for this garage will be grandfathered in if they choose to stay in this garage. Note: Carpool spaces in the 1329 garage will remain unchanged for those with the carpool decal; reserved department spaces will be revised and the affected departments notified accordingly. Blue lots throughout the UF Health campus may be further from work assignments, but decals for these lots cost less and the lots are served by our UF Health Shands shuttle service. Other lots are also available on the UF campus within walking distance or a short bus ride to UF Health. Direct Express Shuttle North (Purple Line): 5:45-9:30 a.m. and 1:45-5:30 p.m. Direct Express Shuttle South (Red Line): 5:45-9:30 a.m. and 1:45-5:30 p.m.
1329 Building (Brown Line): 2-6 p.m.
Access UF Health Shands Parking & Transportation on the “Facilities” site on the Bridge portal under “Employee Services” > “Facilities” > “Services” > “Shuttle Services and Maps. We are here to assist you during this transition. Current decal holders for these garages will be contacted again and reminded about these changes. We are also working with UF to ensure a smooth process for these garages during this time to ensure new decals are ready and available Aug. 1. We will continue to monitor parking as these changes go into effect and make future changes as needed. Thank you for your support as we continue to address challenges and work to improve our parking system across UF and UF Health.